Holidays are for recovering, doing as little as possible, eating and drinking, and reading books. This week Tom gives his takes on why a physically challenging trip offers as much of a break, if not more, than the above. “A beautiful wash of blue, purple and orange sky with snow-capped peaks in the background and folded valleys in the foreground. My dinner was being cooked for me, while I lay back on a rock, enjoyed the last warmth in the sun and finished writing a few postcards to the folk back home. A slight chill in the wind sent me to look for my jacket that gave me a warming hug. It can be hard to remember you’re at 5,000m (16,400 ft) at moments like this. My challenge the next day was to wake at midnight, don a lot of goretex and thermals, and shuffle slowly in the dark to the top of Peruvian volcano, Chachani(6,057m, 19,872 ft). Now, I concur that a 6-hour hike up a moraine in sub-zero temperatures in the middle of the night doesn’t sound much like a day in the Maldives. But for a truly existential opportunity to come to you, the very why of it all, nothing can beat that just-put-one-foot-in-front-of-the-other walk. On holidays, I generally want to go away from the day-to-day to think about things. However, I find that the real ability to gnaw over the minutae escapes me because the bar starts serving gin fizzes at midday and it’s never too early ‘cos you only get to go on holiday once a year’ etc etc. I read books and love that famous writers elucidate what I see only as esoteric mist. The beach makes me say to myself ‘I’ll get that novel out of me’, but it’s a somnolent, soporific promise. Go home, get fit, all the while the present state me is gorging on full breakfasts, boozy lunches and a pudding at every opportunity. Plus a few wines. And I love all of that. But after a few days, I always feel that maybe I’ve relaxed too much. Is this plan making simply a way of making my want-to-be-self sick of my present-moment-self? All are plans made on sand, in that thick, heavy air. The journey to the top. I don’t know anyone here on this desolate rock, with people but with no one. 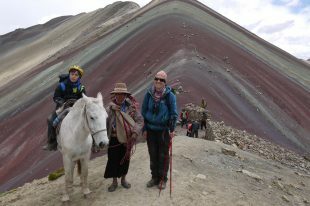 A young Dutch man signed up without acclimatising and without any trekking experience. He stayed at base camp. We’re following our guide and helper, and at many points I wondered why on earth we are doing this, and why are they. The Peruvians in the group were determined to save all their breath for the summit, and there was no chat. I start to get tired after a few hours. Tired of one step forward and a slip backwards. If there’s no point in this, there’s no point in anything. I look around and up, my head torch joining the billions of twinkles of lights in the clear night sky. I consider my position among the stars, being stuck or pushed onto this rock zooming around all these other rocks zooming around, the speeds of space and yet I’m not moving. But we’re always moving, and I’m slowly getting to the top. It’s been five hours now. Inner Smeagol. Why do this? Why not. This is rubbish. This is brilliant. I’m not an adventurer. I love adventure. I want to be alone, I want to see my family and friends. I’m with people. You don’t know anyone. Does anyone know me? It’s cold. It’ll never get warm again. My head hurts from the height. Drink water. The water is colder than liquids can be, empty feeling. This is too long now. I think about the beach. As thoughts turn icy and as black as the depth of the night, in a blink the sun comes up and its warming rays enter my mind and soul like molten lava. We are all capable. If I can do this, I can complete what I want. I just need to make the changes. If I can make this effort, imagine how strong that will be at home. Away lethargy! I made the top, the view was truly incredible and we all congratulated each other on making it through the penitentes (crazy wind-formed ice formations unique to the Andes), over the ice and to the cross at the top. No one ever vocalised anything that had been processing internally, least of all me. After a 7-hour climb up, we leapt down on shingle and morraine in an hour to get to basecamp, and then 60 minutes more to get to the car. The journey up had taken four times as long the journey down. So much more effort, long, raking time, to get to the crystal clear state thinking in the thinnest of air. It wasn’t really about everyone else, or myself or the hill. It was about pushing, and pushing and chipping away at things I knew to find something new. None of this is ground breaking philosophical thought. It was, by any by any other definition than those that we frame for ourselves, a pointless objective. But further ambitions I set for myself that night have been achieved. I’ve written a script, published some short stories and learned to do scramble about less. And how to say no sometimes. So climb a hill. Cycle that continent. Camp in places so remote even the sheep don’t visit. Push yourself. The beach is always there. And I’ll wager you’ll come away with a stronger feeling of what you being alive is really all about. Tom reached the summit on this video. Contact us for more information about adventure travel in South America.